On a recent trip to Shanghai, I visited the beautiful and historical Yuyuan Gardens and got my fare share of facebook pictures posing as a lotus-footed Ming Dynasty concubine, blissfully feeding the royal goldfish of the summer palace garden ponds. The leafy green tranquility and static, dusty, historical silence of the place truly makes it worth a visit, despite the hoards of tourist-scamming douchebags just outside the area getting all up in your face about custom-made suits and knock-off watches. The more you travel around Asia the more invisible these people become though, they blend in with their surroundings like spiders on the wall, and without them Southeast Asian tourist spots would almost seem unnatural. 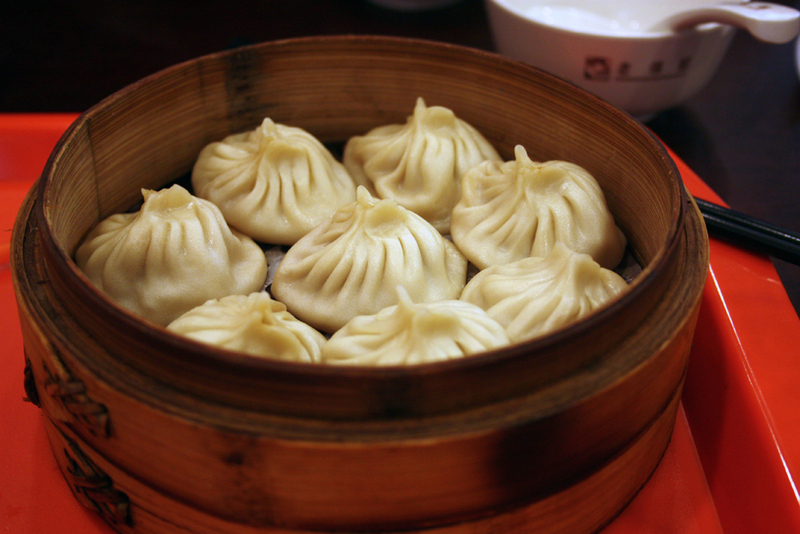 Anyway, just outside the Gardens are a number of great little dim sum restaurants where one can fully indulge in what Shanghai is perhaps best known for, xiaolongbao – soup dumplings. As far as I know two versions exist and I felt it was time to try the one I haven’t before. Bamboo basket steamers containing countless different types of buns and chili-seasoned crustaceans. 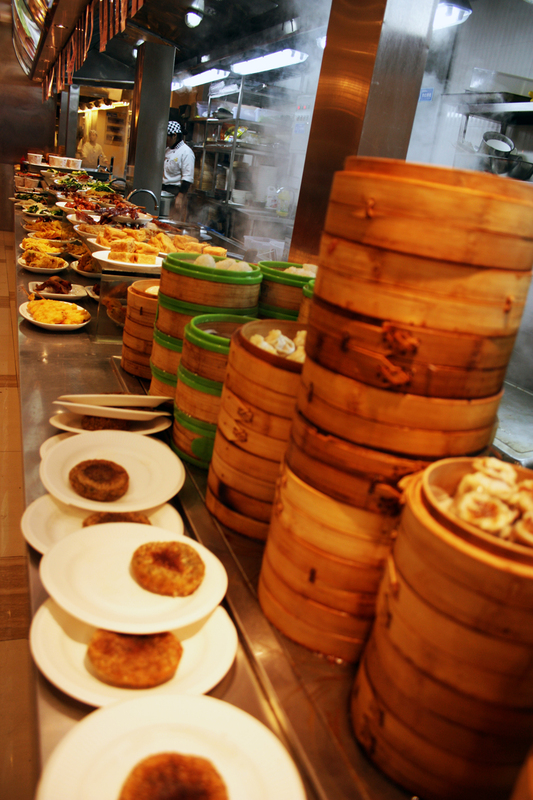 The first type is the more traditional and popular XLB. 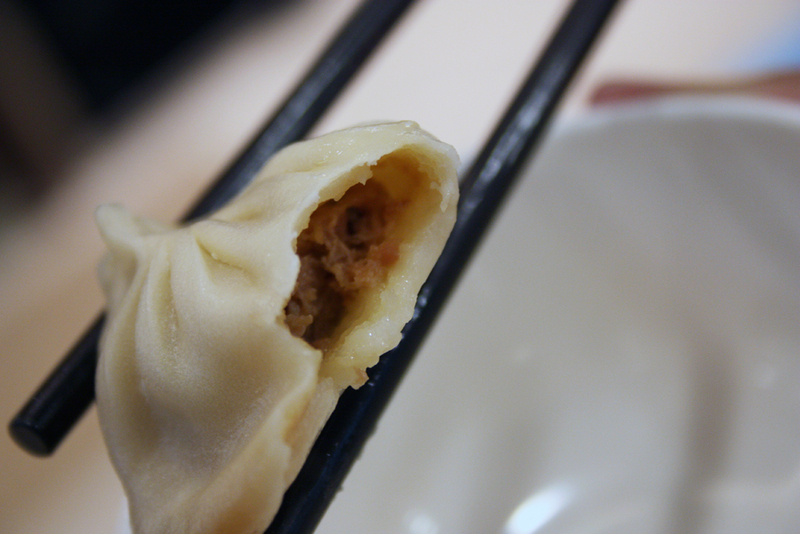 A partially raised flour dough pocket is filled with a solidified, gelatinous chunk of pork soup aspic, twisted shut and steamed in a bamboo basket, directly on top of a thin layer of dried leaves or cabbage which the bottom of the dumpling sticks to, making it pretty difficult to lift these little guys up without ripping the wrapper and spilling the goods. It’s a test of skill and patience, and a never-ending inside joke between locals and expats. Like the Hungarian grandma-made aspic so near and dear to my heart, this stuff is easier to make when it’s cold outside, as that is when the gelatin can solidify enough to use in a dumpling. Like congee, it is one of those wintertime comfort food classics. Anyway, I’d had these before at a dim sum place in Hong Kong and they were actually a bit better there. These were fine too, although the dough was too thick and starchy for my taste instead of the thin, delicate and very fragile translucent wrapper I was expecting. There also wasn’t enough liquid on the inside, which made the dumpling deflate a bit around a single wad of pork. The pork was moist, however, and had a very nice texture and the soup that was there was very simple and clean but flavored deeply with pork, ginger and veggies. Not bad, but not the best xiaolongbao I’ve had. 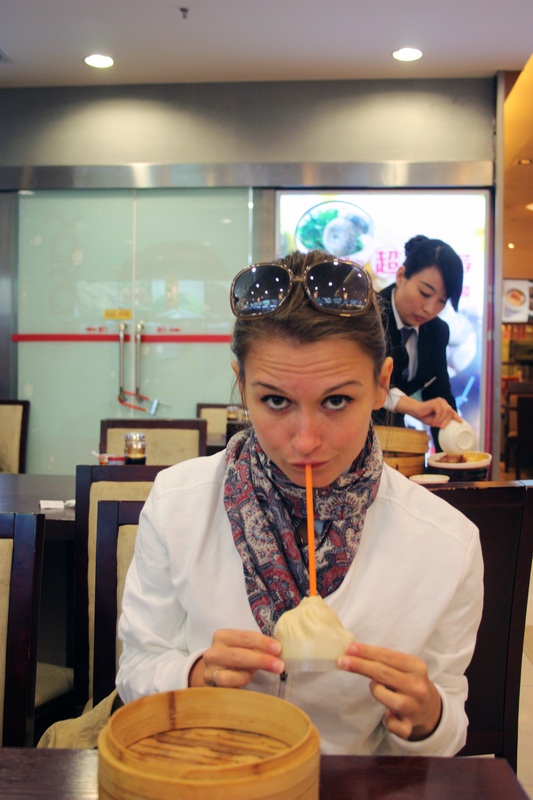 Next up, the type I hadn’t tried before, xiaolongbao through a straw. It’s basically a massive version of the little guys described above, with a dough that is a bit thicker and starchier. 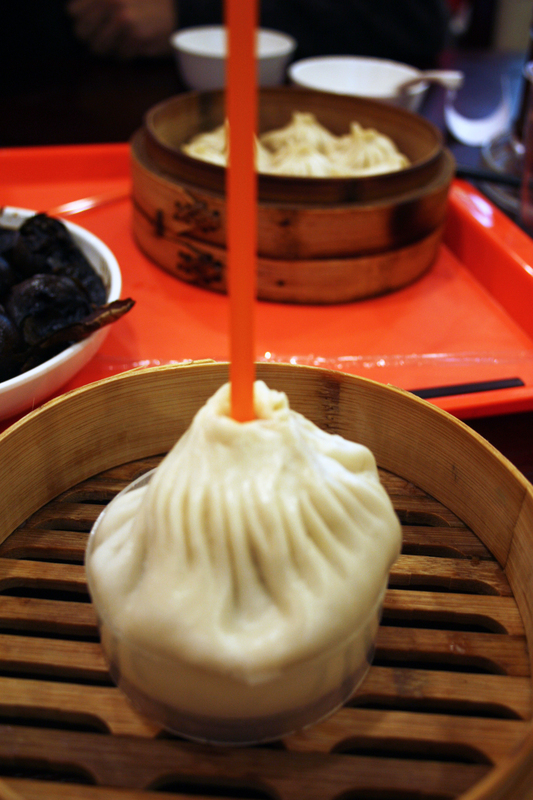 A hole is punched at the twisted top of the dumpling and a straw is inserted. The veggie and pork broth within is sipped through the straw and then the dumpling is either torn up and eaten as bread (which I saw some people doing but which didn’t really appeal to me) or tossed aside. The liquid within is, again, very clean, with just a gentle essence of sweet, meaty pork and steamed vegetables. A surprisingly large amount of it fits into the dumpling as well, which makes it a great alternative for a hot cup of Starbucks on a cold winter day. 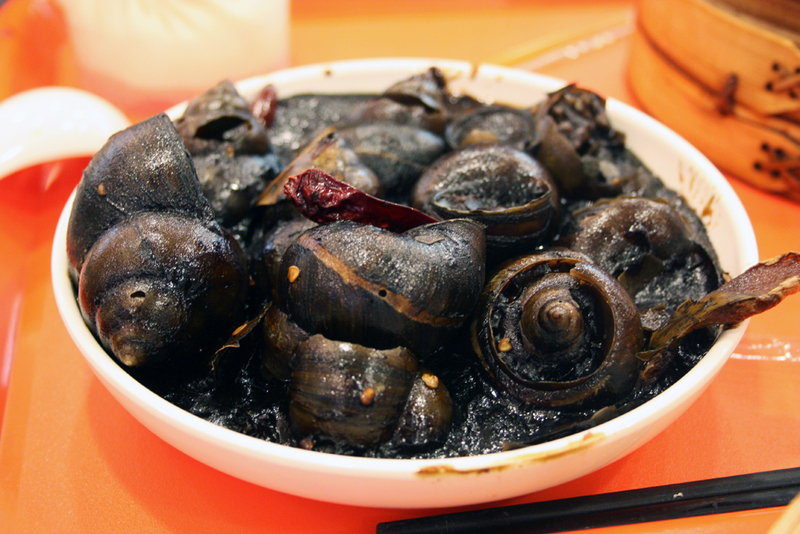 And finally, the Shanghainese version of escargot – marine snails (periwinkles?) in black bean sauce. The sauce, known locally as douchi, is made by fermenting and salting black soybeans until they form a dry, soft paste which has a very pungent and spicy flavor, very salty and a tad bitter from the fermented component. 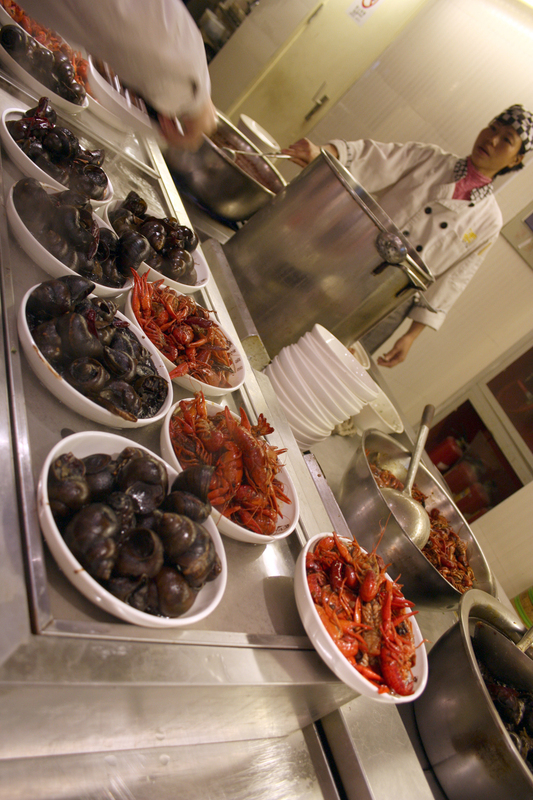 Although in some cases, the paste is watered down to a more liquidy sauce, here it was kept pretty thick and viscous, coating the snails with its starchy texture while also contributing a ton of flavor. The actual snail is eaten by piercing a toothpick through the animal’s flesh and pulling it out of its twisted canal of a home. They don’t differ too significantly from clams and mussels in texture or the minimal flavor, which makes the aversion people have to “snails” strange to me. It’s chewy and gummy, a bit like the chunks of cooked clam in a chowder. The sauce makes the flesh hearty and packs it with flavor. And that’s what I had in Shanghai, folks! Going there today! Hopefully I can find the giant soup dumpling my girlfriend has been waiting for!